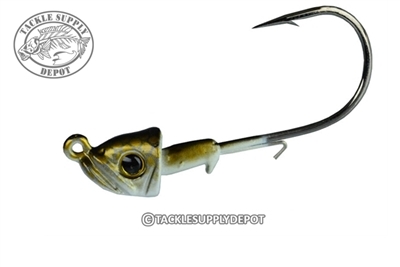 The Picasso Smart Mouth Mustad Jig Heads are ideal for both fresh and saltwater applications and fulfill the demand for an assortment of hooks in a broad range of sizes from 1/16oz to 3/8oz with a hook range of 4/0 to 5/0. Perfect for using on Umbrella rigs; the lighter heads prevent fatigue while providing a large enough hook not typically found in lighter heads. A lifelike appearance finishes off any swimbait or grub paired and is great for slow rolling bottom structure or using on the Picasso Umbrella Rigs. Available with Mustad 3X Strong 30-degree Hooks. Killing them on the smart mouth and Fat Rockvibe shad setup.